The view was incredible, like all other hotels there. The staff was nice and tried to help with problems. I slipped and fell on the stairs in a room. A step was not leveled and I hit my waist and twisted my back. I had to lay dawn whole day to cool my waist and back. It was happened when a service person came to pick up our break fast tray. He told us that he did same thing many times. The meaning, they knew this step is dangerous for a guest staying there. They didn’t tell us at all. It is their lack of responsibilities. Beautiful room with a fabulous view of the caldera. The heated plunge pool was the icing in the cake. The food from the hotel restaurant was exquisite. The staff was friendly. Manos the gentleman at the reception was extremely helpful in arranging a rental car and providing detailed information on the area. We loved it. 5 star experience all the way around. The staff were so welcoming and accommodating. They deliver amazing breakfast to your door every morning. It was the perfect location between Fira and Skaros Rock! The views were unforgettable! Friendliness of the staff, beautiful view and the wonderful deck to enjoy it when eating breakfast or drinking champagne. The hot tube was a bonus, in complete privacy but yet open to the spectacular views. I can’t say enough good things about our stay here. The staff are amazing - there to help with every need and want. We found the location in Imerovigli to be perfect...close enough to walk into Firá for shops and restaurants but away from the crowds that came with the cruise ships throughout the days. We enjoyed the walk but rides can be arranged through reception as needed. Room service menu is very nice if your preference is to stay in. Breakfast and coffee each morning with the picturesque views was incredible. The room was super clean and the bed was very comfortable. So glad we stayed here! The staff was amazing. They were very helpful in setting up trips and making reservations as well as giving us their recommendations for things to do in the area. If it weren’t for the staff I think I would have rated my stay a lot lower. Lock in a great price for Aqua Luxury Suites Santorini – rated 9 by recent guests! Aqua Luxury Suites Santorini This rating is a reflection of how the property compares to the industry standard when it comes to price, facilities and services available. It's based on a self-evaluation by the property. Use this rating to help choose your stay! One of our best sellers in Imerovigli! With panoramic views of the Aegean Sea, the caldera and the volcano, Aqua Luxury Suites Santorini features elegant accommodations, some with an outdoor hot tub or plunge pool. Breakfast is served daily in the suites. Free Wi-Fi is available. All suites are uniquely decorated with hand-picked items and open out to a private, furnished balcony or terrace. The sitting area comes equipped with a flat-screen, satellite TV and CD/DVD player. Air conditioning, bathrobes and a hairdryer are included. The 24-hour front desk at Aqua Luxury Suites can arrange car rental or a private chauffeur to explore the island. Guests can learn to cook Greek dishes or try Santorinian wines during cooking lessons and wine tasting. Sailing excursions are organized upon request. The famous beaches of Perivolos and Perissa are around a 20-minute drive from Aqua Suites. The lively Fira is 2 miles away, and the scenic village of Oia is 5.5 miles away. Athinios Port and Santorini National Airport are 7.5 miles away. 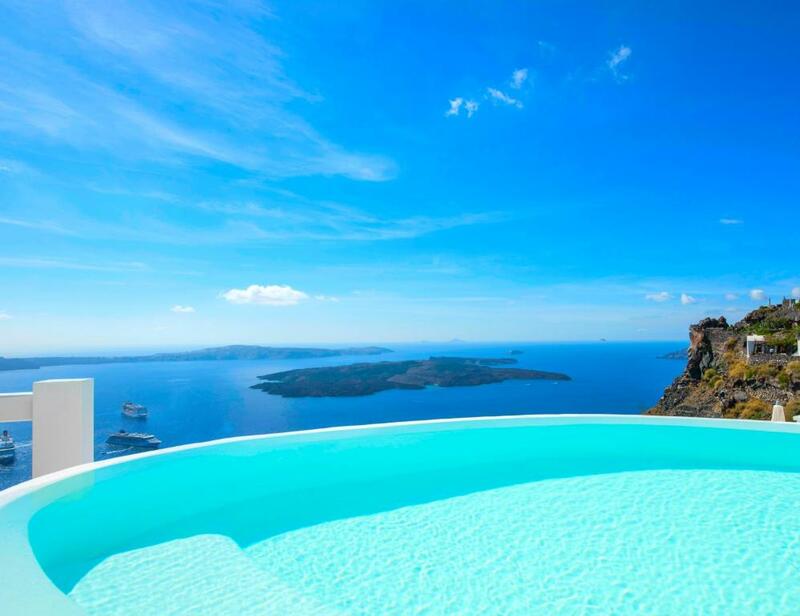 When would you like to stay at Aqua Luxury Suites Santorini? -a seating area with flat-screen satellite TV. Featuring an outdoor jetted tub, this air-conditioned suite opens to a furnished, private balcony with unobstructed Aegean Sea, Caldera and volcano views. It offers a seating area with sofa and flat-screen, satellite TV. Free Wi-Fi is provided. Please note that all suites at the hotel offer full breakfast served daily. Please note that this room type is not suitable for small children and disabled guests, as it has a staircase. Opening to a private, shaded balcony with an outdoor jetted tub and 2 sun loungers, this air-conditioned honeymoon suite enjoys unobstructed views over the Caldera, the Aegean Sea and the Volcano. It has a seating area with sofa and flat-screen, satellite TV. Free WiFi is provided. A full breakfast is served daily in the suite. -full breakfast is included and served daily in the suite. Featuring a private jetted tub with Caldera views, this air-conditioned room opens to a shared 30-m2, furnished terrace. Free WiFi is provided. This elegant Santorinian residence comes with air conditioning, a spacious bathroom with shower, a king size bed, luxury toiletries, mini-bar, free WiFi and safe deposit box. It opens to a small courtyard with partial view from the lounging and seating area. -a terrace with sun beds. Offering sea views, this air-conditioned room comes with a flat-screen TV. Bathrobes and slippers are included. Free WiFi is provided. This suite features a seating area, mini-bar, bathrobes and slippers, toiletries and balcony or terrace with sea views. Boasting a private outdoor plunge pool and offering Caldera view, this villa features a sofa, flat-screen TV and private entrance. Boasting a private, outdoor jetted tub and offering Caldera Views, this villa has a seating area, sofa and dining area. Offering views of the Caldera and the volcano from its private balcony, this junior suite includes a king-size bed, a bathroom with bathrobes and free toiletries, and satellite, flat-screen TV. Superior Suite with Outdoor and Sunset Panoramic Sea View. Offering views over the Caldera, the Aegean Sea and the Volcano, this semi-detached suite has 2 separate bedrooms with king-size beds, and 2 bathrooms. Free WiFi is available. Featuring a 80-m2 terrace with an outdoor pool and panoramic views over the Caldera, the Aegean Sea and the Volcano, this suite has a bedroom and a living room. Air conditioning, a flat-screen satellite TV and a mini-bar are available. Free WiFi is provided. Aqua Luxury Suites & Villas offers pure comfort and splendour in an amazing Cycladic atmosphere. Astonishing vistas and supreme accommodation defines our hote and allows you to invigorate your body and soul in Santorini. The refined modern furnishing and elegant interior design, the natural sunlight and the amazing selection of luxury amenities welcome you to experience the ultimate holidays in Santorini. Our team of professionals at Aqua Luxury Suites in Imerovigli will make sure you feel at home, providing exceptional tailor made services and pampering you beyond compare. Aqua Luxury Suites & Villas offer supreme accommodation in Santorini, located ideally in the picturesque settlement of Imerovigli. With smooth access to the major sights and attractions of the island and without the noise of the town center, is a sanctuary of absolute tranquility and bliss. Thanks to its location, our hotel boasts panoramic sea views in a setting of unparalleled beauty. Enjoy breathtaking views to the Caldera, the Volcano and the endless Aegean Sapphire blue. Discover the uniqueness of Santorini and explore its hidden treasures of historic value and tradition. The Cycladic aura embraces you at Aqua Luxury Suites in Imerovigli, as you gaze at the horizon and admire the spectacular sunset views with the warm colors overwhelming the skyline of Santorini.